As we have mentioned in past blog entries, Curtain-Tracks.com offers bunk curtains that are often used in ships and on oil rigs to provide privacy in the berths. But bunk curtains are certainly not limited to these commercial applications. Whether you may be trying to provide some privacy in bedrooms shared by siblings, or perhaps in a beach house or ski chalet where there are multiple bunks in guest rooms to provide greater sleeping capacity, bunk curtains may be just what you need. A recent entry at ApartmentTherapy.com highlighted a few great examples where bunk curtains were installed. These curtains not only serve their function to provide black out capability and privacy, they really enhance the overall appeal of the room. The look and feel of the room can be greatly impacted by the addition of colors and textures, and bunk curtains in a bedroom offer an opportunity to introduce new elements into your design. In addition to the basic functionality of privacy and providing light blocking, bunk curtains can also offer an element of fun into kids bedrooms. 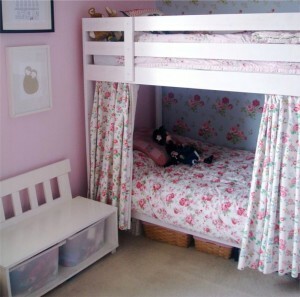 Space constraints often dictate the use of bunk beds in children's bedrooms. A child's imagination can turn a set of bunk beds with curtains on tracks into a fairy princess castle, a spaceship, a club house, or a reading nook....the possibilities are endless. 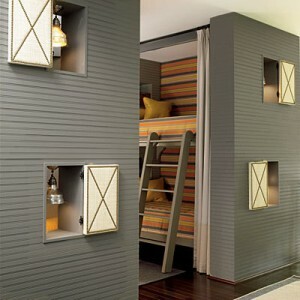 Plus, bunk curtains can conceal storage if the bottom bunk is removed and that area serves as a closet or desk area. To see some high profile bunk beds with curtains on tracks, you need look no further than the set of the Disney TV show Jonas. The Jonas Brothers spent the 2009 season of their hit TV show bunking in the beds shown on the set in the images below. In fact, the set designers of the Jonas show are Curtain-Tracks.com customers. If you've got the bunk beds and want to give the bunk curtains a try, we've got just the tracks you need to maximize their use. We're always here to offer a suggestion if you need help picking the right curtain track.